As you can see we are not entirely Human but are more Felines and Carian/Reptilian. We all walk upright. 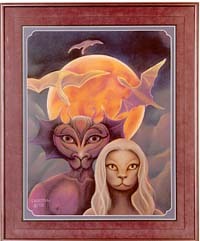 The Carians (bird people) and the Felines were in this universe long before the Reptilians and the Humans were created. The Human prototype is actually the youngest of the 4 primary universal races. 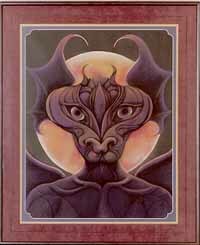 They were created about the time that the Reptilians were just achieving space travel. Jehowah and I in our natural state at the time of their marriage on Avyon. This picture I am told was of the time before our planet was destroyed by a civil war between our races. This alliance marriage did not last because I could not integrate my husband’s reptilian ways. I returned to my people. This, too, fueled the fires that led to war between our two families and consumed our planet. We are married again on this dimension and so far we are making it, but it has not been without struggle. I firmly believe that without the Keys of Compassion, I would have left him again. Note the Carians in the background and the picture of a red-gold planet. I wonder if this represents Nibiru, or perhaps Avyon? What do you think? Cobazar & Divai, Jehowah’s Mother and Father – Jehowah and I share the same mother but we have different fathers. I am not sure but I think this portrait is more symbolic of the union between the Light and Dark, Reptilian and Human than it is of our parent’s real likeness. In any case, I knew for some time that my mother could not give birth to Jehowah and had to have a surrogate birth mother for him. When I received the picture from Phyllis Furphy, a channeled message accompanied it and said that Jehowah was the egg. Note the lavender of her dress. I am told that lavender is the color that represents the 9D Nibiruan Council and the ship, Pelegai. Also, the background colors of gold and red are the colors of Nibiru. 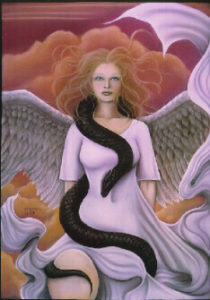 Phyllis has never met me in person, has never read my book and knows nothing of Nibiru.